The cobbled courtyard was the entrance to two restaurants. The one that was a definite for me was Creperie Beaurepaire. This creperie felt like it was something out of a movie scene with being surrounded by greenery, brick wall and greenery. The cobbled area added to the cuteness. 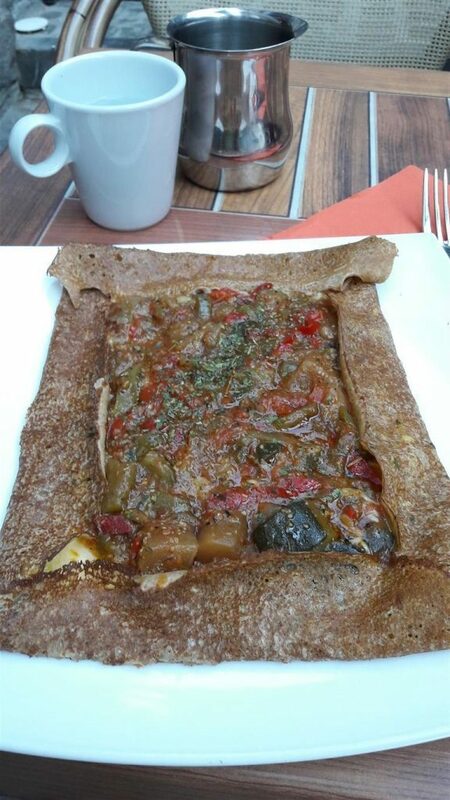 A buckwheat crepe filled with scrambled egg, ratatouille and cheese was ordered. The square crepe had a superb flavour and aroma. The fillings were an open topping and not folded over in the crepe. Chunks of peppers, courgettes, aubergines and tomatoes merged well with the cheese. The egg had a lighter flavour. It seemed like the layers of the crepe were egg, topped with cheese and then the ratatouille. The food was brought out fresh and there was a lovely aroma of the crepe when it was served. Hot water was given in a small silver jug. It was difficult to choose the sweet crepe for dessert. But as I felt that it would be better with ice cream, the choice got slightly narrower. After Eight was mint ice cream and chocolate on a crepe. Again Creperie Beaurepaire outstanded itself. The ice cream was refreshing due to the mint. 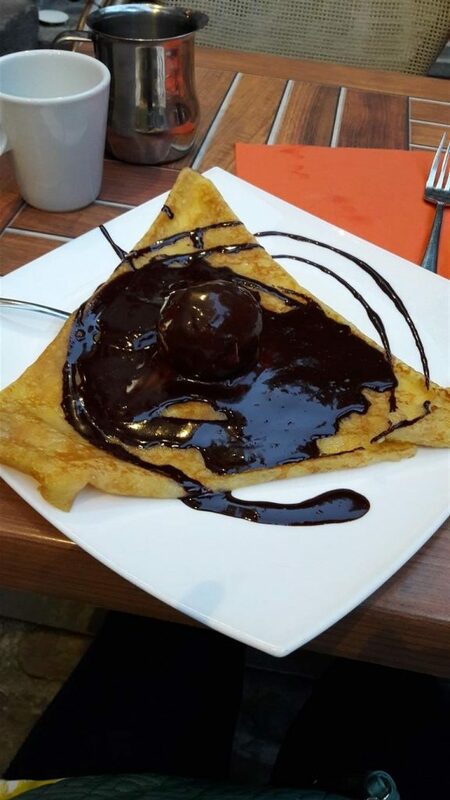 Pure indulgence was provided by the rich chocolate sauce smothered on the crepe. Even the scoop of ice cream was coated with chocolate. The crepe on its own had a super flavour and the dessert was thoroughly enjoyable. There were only two staff at Creperie Beaurepaire serving and taking orders. But they were efficient, friendly and gave good service. They were happy to say which crepes they would recommend. 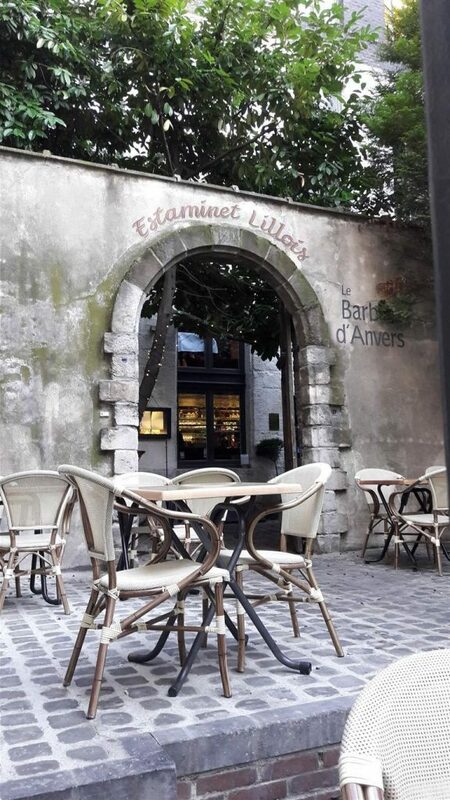 It’s worth seeking out Creperie Beaurepaire hidden away down one of the side streets. Try to make a reservation of you can so that you definitely get a table as Creperie Beaurepaire seemed quite popular. When I was there, I was their first customer of the evening, but the place got very busy soon after. Some customers were turned away as they had just wanted to have drinks. It would have been fine for them as there are plenty of bars in the vicinity. Creperie Beaurepaire is a must for anyone who visits Lille.